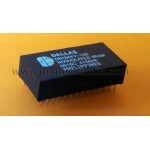 Buy online DS3231 RTC IC in India at low cost from DNA Technology, Nashik. DS3231 IC is a low-cost, extremely accurate I2C real-time clock (RTC) with an integrated temperature compensated crystal oscillator (TCXO) and crystal. The device incorporates a battery input, and maintains accurate timekeeping when main power to the device is interrupted. The integration of the crystal resonator enhances the long-term accuracy of the device as well as reduces the piece-part count in a manufacturing line. 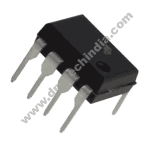 The DS3231 is available in commercial and industrial temperature ranges, and is offered in a 16-pin, 300-mil SO package. DS3231 Real Time Clock maintains seconds, minutes, hours, day, date, month, and year information. The date at the end of the month is automatically adjusted for months with fewer than 31 days, including corrections for leap year. The clock operates in either the 24-hour or 12-hour format with an AM/PM indicator. Two programmable time-of-day alarms and a programmable square-wave output are provided. Address and data are transferred serially through an I2C bidirectional bus. A precision temperature-compensated voltage reference and comparator circuit monitors the status of VCC to detect power failures, to provide a reset output, and to automatically switch to the backup supply when necessary. Additionally, the RST pin is monitored as a push button input for generating a μP reset. 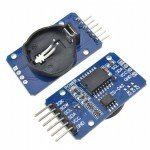 DS1307 RTCThe DS1307 serial real time clock (RTC) is a low-power, full binary-coded decimal (BCD) cl..
DS3231 RTC Module with EEPROMThis RTC module is based upon Maxim's DS3231 RTC IC. DS3231 is a low-co..
PCF8563 RTCThe PCF8563 is a CMOS Real-Time Clock (RTC) and calendar optimized for low power cons..
DS1244Y Non-Volatile RAMThe DS1244Y 256K NV SRAM with Phantom Clock is a fully static nonvolatile RA..
DS3231 RTC ModuleDS3231 is high precision clock module. 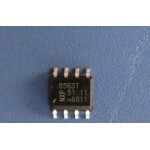 It can also be used on Arduino motherboard. ..